Propertia - Real Estate Listings Toronto - Propertia. 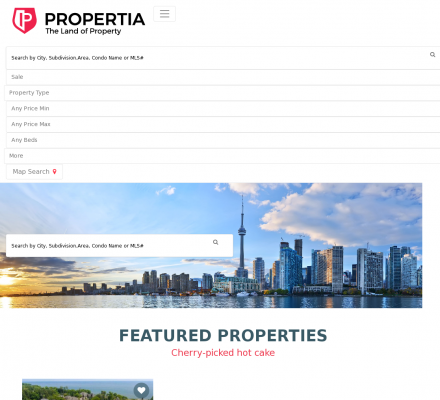 Propertia.ca is an Online Real Estate Portal giving you the opportunity to search for your new property in Toronto, Canada, from tens of thousands of daily updated real estate canadian MLS listings. Pick the neighborhood you want to live in, i.e. Toronto Downtown, Yonge-Eglinton or any other, and choose from houses, condos or townhomes, schedule a showing and our real estate agents will gladly help you with the purchase. Find the perfect property within minutes and get professional help from our agents that will assist you with the purchase of your new home. Begin a new life in a new condo in Toronto. Description: Business, Real Estate, Agents and Agencies - Propertia - Real Estate Listings Toronto. Propertia. Blue Valley Real Estate (Popularity: ): Tinkler Partners offers real estate resources for the Overland Park area and surrounding Johnson County in Kansas.